Two years ago today I wrote the first tweet that sparked the #amwriting community into life on Twitter. Today, the energy within this group continues to blow me away. 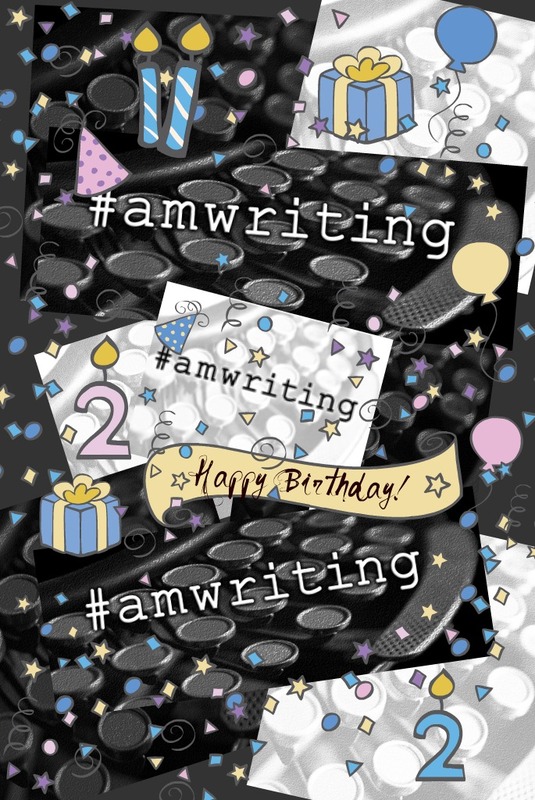 To celebrate the hashtag's birthday, more than 25 bloggers have signed on to post photos, essays, short stories, poetry---gifts for the community from the authors who participate there. The idea of a blog party only came to me a few days ago. I posted the idea---with very short notice---and writers jumped in with enthusiasm. (I say we have more than 25 writers because every time I attempt to get the number right, more writers join in.) Today, as part of this blog party, I want to share with you one of the many reasons this community is vital to me as a writer in The Gem State. Idaho is big. There are not a lot of writers near my home. If you live outside The West, you might not realize just how big Idaho is. Heck, a lot of people who live here can't quite grasp it. Southeastern Idaho is full of farmland and small towns. The rivers chisel right through volcanic basalt and the waterfalls will take your breath away in the springtime. The Sun Valley area boasts movie stars and resorts, but drive a few miles farther and you'll find campgrounds filled with trailers and tents. The lure of The Sawtooths crosses boundaries. In Southwestern Idaho, we have mountain scenery to take your breath away. We also have deserts and sand dunes. We have sagebrush and evergreens, sometimes co-existing. Central Idaho is farther north than many Southern Idahoans ever venture. When I was living in Lewiston, Idaho, we had a politician tell us he'd crawl all the way up Highway 55 to Lewiston to get our votes. Yeah, funny, since Highway 55 doesn't go north of New Meadows--and Lewiston is another 2.5 hours north from there. And the prettiest drive you can imagine is the one between Lewiston, Idaho and Missoula, Montana. Highway 12 is the kind of beauty that makes me use swear words as adverbs: ____ beautiful. But wait. Don't start thinking Lewiston is North Idaho. And don't start feeling you've seen it all just because you've traveled Highway 12. It'll take another 2.5 hours to drive up to Coeur d'Alene, Idaho (where you'll find Interstate 90 cutting up from Missoula, MT). Now you think you can just cross over into Canada from there? Think again. You want to zip up to Sandpoint, Idaho? It will take another hour. Of course, you have to see both Coeur d'Alene Lake and Lake Pend Oreille while you're there, so you're going to need more time. From Sandpoint? You'll still have to drive about an hour north to get to the Canadian border. To drive the direct path through Idaho, from South to North (or vice versa, depending on your Idaho orientation), it will take over 14 hours. That's in the summertime, when roads are good. And on that route, you'll miss that whole big, beautiful portion of the state near Yellowstone National Park. You'll miss The Sawtooth Mountains. You'll miss that gorgeous stretch of Highway 12. You'll miss the wilderness, the rivers, the sand dunes, the boat trip up Hells Canyon. My heart breaks with all the things you'll miss. Idaho is my home. I love it here. And yet I need the community of other writers. So every morning, I get up before dawn and switch on my computer. By the time the Boise foothills glow with morning rays, I've chatted with authors all over the world. By the time the sun sets over the Owyhee Mountains, I've finished a good day's work in the presence of some of the smartest people anywhere. And I've managed it all in the gorgeous solitude of my home state. Thank you, #Amwriting. Happy birthday. If you'd like to continue on the blog party, the next stop is the blog of John Ross Barnes. John is an integral part of the #amwriting community and I look for his tweets every day. His blog is: "Love This Life, Onward Through the Fog." I had the same problem! I kept thinking of places to add. When I was growing up, I'd ask my dad if he had any desire to see the world. He'd say, "I haven't seen all of Idaho yet." Love this post Johanna. What a great way to share our beautiful state with the world. Happy Birthday #amwriting! I'm one of those native Boiseans. I'm proud of it. I would never leave it. The grass is greener HERE. Thanks for the beautiful pictures. Thanks, Carley! All the photos here are links to photos on the Visit Idaho site: http://www.visitidaho.org/ There really is nowhere I'd rather live. I hear you, Janis. Even when I'm traveling, Idaho still claims me and pulls me home. I'm staring at the Teton mountains from my window. Idaho is amazing - thanks for all the wonderful photos. Happy Birthday #amwriting! Mmm. The perfect office space! Johanna, did you know that during World War II Lake Pend Oreille was used to train by the Navy. They had submarines there. Interesting fact. Thanks for the gorgeous pics! Made my morning. I’ve been to all the states except Alaska, and to several foreign countries and Idaho is the best. I love it here. Johanna - You've done a *&^*&$^&^#%^%#-fan-ta-bulous job of capturing the schizophrenia of Idaho. When I travel to other parts of the country, a part of me cringes at telling people I'm from Idaho. Face it - we've got some cringe-worthy elements who wallow in stupidity and hatred. However, the other part of me loves this place. I swore I'd never live here as an adult, and I haven't always, but now I'm back to raise my kids. I've lived in all parts of Idaho, visited every county and most of the communities. My family arrived here at the turn of the last century to homestead. I grew up on a farm and experienced every nasty chore and amazing experience that agriculture can offer. Having said that - discovering the writing community here and the one you've facilitated through #amwriting - has granted me even more intellectually and spiritually. The blessings of the virtual world transcend geographic and cultural isolation. So, Happy Birthday to #amwriting . . . and many more! You're welcome, Megan! I'm so glad you stopped by. When people tell me they've been to Idaho, I always ask what part, so I have a better idea how they picture my world. It's a difficult place to really understand---and that's part of what I love about it. I hear what you're saying, Liz, but refuse to let the hateful people represent us. I really love this place. I agree, Johanna! I KNOW the cringe-worthy elements do not represent the vast majority of people here. Thoroughly fabulous post - now, how to integrate it for next week . . . hmmm. I couldn't see the pictures (they didn't load for some reason) but no worries as your discription is enough. I have had clients from Idaho and they have said it's beautiful and warm and relaxing but your words...wonderful. Added "a long drive through Idaho" to my bucket list. Loved the pictures and comments about Idaho. I even looked up the Paddler. Thanks! I'm a little late to this party, but I have to say, Johanna - as someone who's never given Idaho a second thought (sorry! arrogant New Yorker - it's what we do!) these pictures are mind-blowingly, breath-takingly beautiful. I want nothing more than to get in the car and drive around Idaho for a month and just... bask. What a great travelog! I've never been there, but would like to.